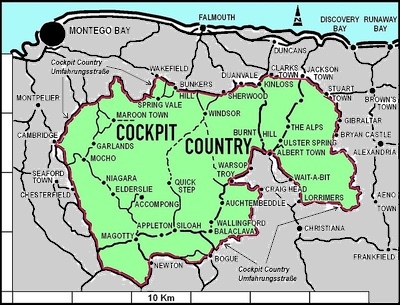 The Cockpit Country is a rugged, remote area of western Jamaica that has the world's most outstanding karst topography, steep-sided hills and deep round valleys eroded from the limestone bedrock. The wildlife of the Cockpit Country is specially adapted to this unique landscape and numerous species occur here that are endemic (found nowhere else in the world). The area is also historically significant because of its importance as a place where the Maroons, runaway slaves, used as an inaccessible refuge. They were eventually able to force the British into signing a peace treaty in 1738. The area is the largest remaining area of intact wet limestone forest in Jamaica and is a refuge for at least 79 of the 100 bird species found in the island, including Jamaica's two endemic parrot species. 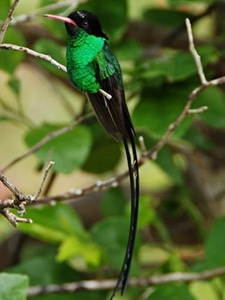 Pictured here is the Red-billed Streamertail (Jamaica's national bird), locally called the Dr. Bird. It is also home to perhaps the only viable population of the endemic Giant Swallowtail butterfly; with a wingspan of up to 8 inches (20 cm) it is the largest butterfly in the Americas. By contrast to the wet tropical rainforest ecosystem of the Blue Mountains on the eastern side of the island, the Cockpit Country is a dry limestone forest. Both regions are associated with significant water systems from rivers such as the Rio Grande and Yallahs sourced in the Blue Mountains and the Cockpit Country supplying water for most of western Jamaica. Five major rivers are fed from the aquifers under the Cockpit Country: the Black River, Great River, Montego River, Cabarita River and the Martha Brae. Five parishes derive their water supply, in whole or part, from this forested area; St. Elizabeth, Hanover, St. James, Westmoreland and Trelawny. The Cockpit Country highlights Jamaica's spectacular endemism, particularly the island's unique flora. Of the 152 vascular plant species found in Cockpit Country, over 100 are found nowhere else in the world. Amazingly, many individual hilltops claim their own unique species. Most of Jamaica's 550 native fern species are found in Cockpit Country and relative to its size, more species of ferns are found here than in any other tropical forest in the world. Bats dominate the mammalian biomass in Cockpit Country, with some caves sheltering over 50,000. The diverse vegetation and topography create ideal habitat for all 28 of Jamaica's endemic land birds. The region also has the highest local diversity of amphibians and reptiles on the whole island, with four new endemic species discovered in 2004. A new species of tree frog, endemic to Jamaica and thus far known only from the Cockpit Country, was only recently described by scientists. There are more than 60 species of plants unique to this region, some isolated to just one hill.